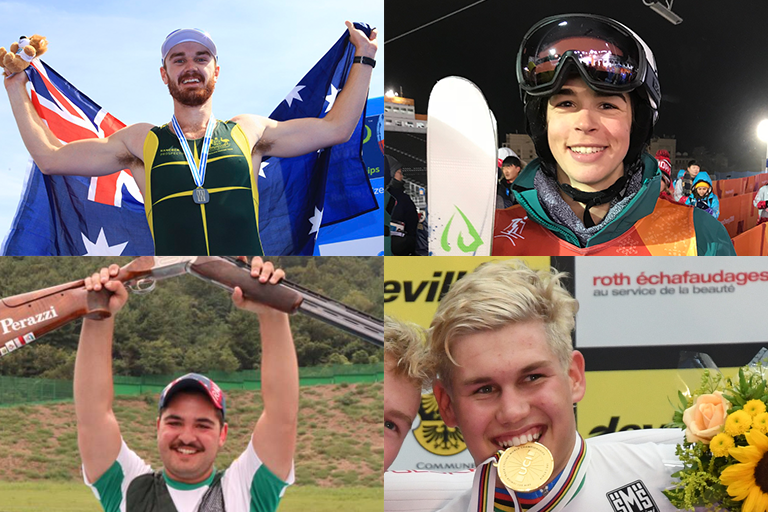 ASPAs finalists for Emerging Athlete of the Year, clockwise from top left, Cormac Kennedy-Leverett, Jakara Anthony (photo AOC), Luke Plapp (photo UCI) and Nathan Argiro. Luke Plapp (Cycling): The 17-year-old took on both the UCI World Junior Track and Road Championships in 2018, medalling in both. Plapp took gold in the Points Race and Madison at the U19 Track World Championships and was part of Australia’s bronze-medal Teams Pursuit. On the road, he was second at the U19 World Championships in the Individual Time Trial. Cormac Kennedy-Leverett (Rowing): A national champion in U19, U21 and U23 categories this year, Queensland’s Kennedy-Leverett rose to the next level by earning silver in the Junior Men’s Single Scull at the 2018 World Rowing Junior Championships and a bronze medal in the same event at the Youth Olympic Games. Nathan Argiro (Shooting): Argiro, a clay-target shooter from Mildura, won the 2018 Universal Trench World Junior Championships and the Trap at the International Shooting Sport Federation Junior World Championships, the only athlete to claim gold in both events in the same year. Jakara Anthony (Mogul skiing): Anthony had a breakout season in 2017-18, her first full year on the World Cup circuit. Aged just 19 at the time, Anthony pushed her more experienced rivals to finish fourth at the PyeongChang Winter Olympics. She also had top-five finish at the Deer Valley World Cup. 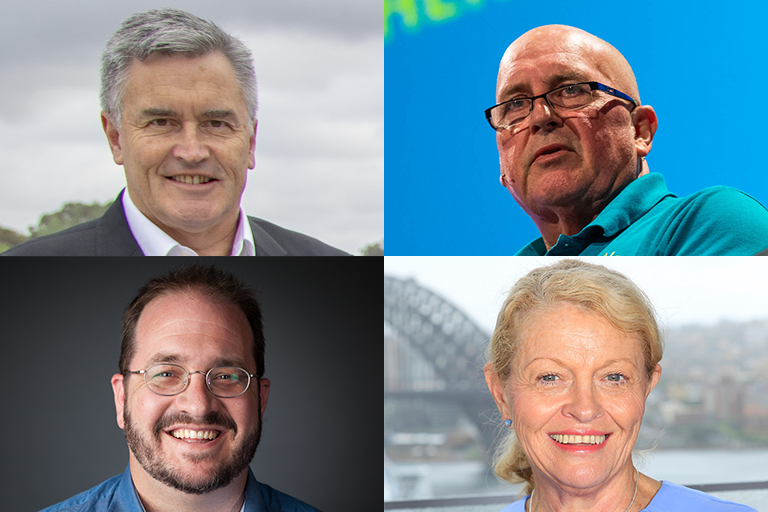 ASPAs Leadership Award finalists, clockwise from left, Ian Chesterman, Craig Phillips, Lynne Anderson and David Bell. Craig Phillips (Commonwealth Games Australia): Phillips has been CEO of Commonwealth Games Australia since July 2015, driving strategic change. He was a member of the Gold Coast 2018 Commonwealth Games Corporation (GOLDOC) Board, which helped deliver the successful home games. Ian Chesterman (Olympic Winter Institute of Australia): First appointed Chef de Mission of the Australian team for the 1998 Nagano Winter Olympic Games, he has held the role for six consecutive Winter Olympics. Chesterman has also been appointed Chef de Mission for the 2020 Tokyo Olympic Games, surpassing the record of John Coates AC and Geoff Henke AO as a six-time Chef de Mission of an Australian Olympic Team. Lynne Anderson (Australian Paralympic Committee): Appointed CEO of the Australian Paralympic Committee in 2015, Anderson has led significant progress, addressing organisational reform and rebuilding its financial strength. Her leadership at the senior level provided a solid platform for Australian athletes who performed at the 2018 PyeongChang Winter Paralympics and 2018 Commonwealth Games. David Bell (Diving): Bell is the CEO of Diving Australia (DA) and since commencing in June 2013 has recreated the sport, especially at the high performance level. DA's high performance program is both innovative and collaborative, one of very few Australian sports to have medalled in the last six Olympic Games. In addition to these awards, the AIS, in partnership with ABC Grandstand, has also launched a public vote to determine the ABC Sport Personality of the Year and Best Sporting Moment of the past 12 months. ABC Grandstand is the media partner for the AIS Sport Performance Awards and Australians can vote at aisawards.abc.net.au from now until 5pm AEDT on 9 December, 2018.